For some, starting a business is a dream, an intimidating one, but a dream nonetheless. Getting all the necessary affairs in order is not a leisurely undertaking. And this is the same for a field service business. From pinning down efficient processes to finding the right people - and every leap and baby step in between - building a solid foundation can be what makes or breaks your business. A week or so ago we covered how to write a lawn care business plan. 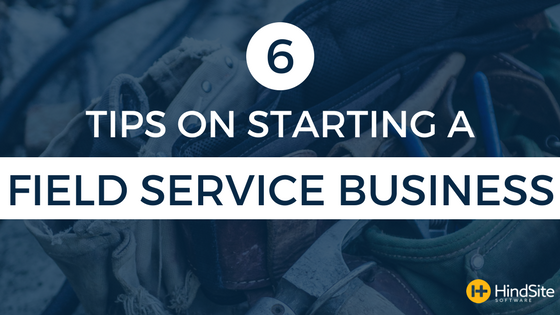 Those tips can be applied to pretty much any type of field service business. Creating a business plan might seem like a waste of time or even a daunting task. But doing so will give you a better understanding of your entire organization - from its structure to services to the finances and numbers that’ll fuel your day-to-day operations. This decision might occur when you’re creating the business plan and determining your structure. Whether it’s a friend, past coworker or one of both, forming a core management team can be a recipe for success. Or disaster. It all depends on the people. Not only should each have some type of relevant skill and/or experience but their personalities should mesh, as well. Only 44% of small businesses survive their first two years. One of the biggest reasons this happens is due to all the moving parts that a business must recognize and manage. Additionally, you could argue a field service business has double the moving parts. It’s a dynamic operation, with employees and crews bouncing from one property to another - project to project. From scheduling to routing to billing to managing the field, each of your operational components must have a standardized process that aligns with one another. The easiest way - and by easiest I mean the one that requires the least amount of time and headaches - is implementing field service software, like HindSite. [Full Disclosure: the previously mentioned software company signs my paycheck]. Whether it’s how you route appointments or send out invoices software has the capacity to standardize every corner of your business. And there’s a chance you won’t fully realize it even happened until you’re sitting around with nothing to do but grow your business. Depending on what type of industry niche you fall in finding qualified and reliable employees might be hard to come by. This is especially the case for green industry businesses, who are experience a labor crunch. But hiring for other industries like HVAC face their own challenges since candidates must have a particular technical skill. And after you have the right people it’s just as important to train them so they’re familiar with your operational processes and code of conduct. Once it’s up and running customers will flock to your business, right? That’s highly unlikely. You’re not Kevin Costner constructing a baseball field in Iowa. Building a customer base takes almost as much effort as starting your business. Some say they go hand in hand. And when marketing in the field service industry is driven by referrals, a young company has a lot working against it. That means you need to tap into your community network, establish a digital presence and get out there, make moves and close some sales. Now that you have some customers and your head’s above water it’s time to look at your business and its operations. Start at a high level and gradually narrow your focus into the various crannies of your business. See what needs overhauling, what needs tweaking and what should be left alone. Then make the necessary adjustments. As a young business you shouldn’t pay too much attention - or compare yourself - to the businesses around you. If you’ve methodically and thoughtfully built your business there’s no need to worry about others. That time may come later, but for now, you do you.